Notable for containing an obituary of its owner, Felix Dennis - a remarkable man. Have gone and purchased his book "How To Get Rich" in tribute - not because I intend to get rich, but because it is an excellent and entertaining book. I am never going to be rich, but having read this book I am reasonably convinced that this is no bad thing. This is in my top 10 favourite books, but it's the first time I've read it in ages. It is good though. I read it for comparison with Dara O Briain's book. A book with a bit of an identity crisis. Is it a tour diary? Yeah, much of it is. Is it a(nother) rumination on English/British identity? Kinda. Dara makes some interesting points and is funny (I'd be tempted to see his show) but the real clincher is at the end, where he points out that the notion of a national identity isn't really anything to do with any alleged shared characteristics but with a shared culture. All of Stuart Maconie's books have punning titles but this is probably the best. A highly amusing account of life as a music obsessive and his time as an NME music journalist. Radiohead often tread a finely balanced route between music for the head and music for the heart. There's enough in the lyrics here to occupy your mind if you're so inclined (although my regular reader will know I'm usually not): is it the singer's last few days, his final words, wallowing in memories? In isolation this would too mawkish for my taste, but the music makes it a definitive requiem. 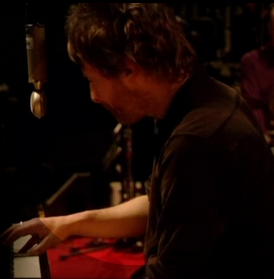 A central, mournful piano progression is surrounded by sparse, fidgeting electronic percussion and shot through with Thom Yorke's thin, pained voice singing like the words are being pulled out of him. It's all very dry, very close and personal. Not comfortable listening by any means but beautiful and wonderfully constructed. There is relatively little pop music that can genuinely be described as haunting, but this is one such track. After some experimentation, I have settled on a multiple-knead method copied from Dan Lepard. He uses it for some specific recipes but I find it works for everything. It's slightly more complicated and takes a longer elapsed time before the bread is ready to rise, but the total knead time is about 2 minutes over an hour, rather than 10 minutes at once. Your arms will thank you, I promise! Here's the method I use for a loaf in a tin (which is a bit easier than shaping a free-standing load). There are three stages. Mix the flour and yeast together in a large bowl. Add the water to the flour, a little at a time, mixing until you have a rough ball of dough (you may need to add a little extra flour or water). Take the dough out of the bowl and knead on a floured surface for about 30 seconds. Form the dough into a ball. Clean and oil the inside of the bowl. Place the dough back into the bowl, cover it and leave for 10 minutes. Repeat the 30 secs knead twice more at 10 minute intervals, then leave for 30 minutes. Knead once more, then place in the bowl and cover. Leave to rise until the dough has roughly doubled in size (about an hour, can be up to 2 hours). Take it out, press all the air out, form into a ball again and put it back in the bowl. Leave to rise again. Prepare a tin by greasing the inside and then dusting the inside with flour. Once the dough has roughly doubled in size again, take it out and press all the air out. Roll into a sausage a little shorter than the tin and place in the tin. Leave to rise until roughly doubled in size - usually about an hour or so. The bread is ready when you press a finger in and the dough doesn't spring straight back. Pre-heat the oven to about 220 C with a small baking tray in the bottom. Boil a kettle and put the water in the baking tray in the oven. Cut a slash on top of the loaf with a bread knife. Spray the loaf with water. Place the loaf in the oven for 10 minutes. Spray the loaf with water again and reduce the temperature to about 180 C.
Take the bread out and cool on a wire rack. There's a lot of snobbery and rubbish written about the ingredients used in bread, which is all the more remarkable when you consider that only four of them are absolutely required. Obviously good quality ingredients are better than poor quality, but if you can actually taste the difference between bread made with normal tap water and bread made with the finest bottled mineral water, then, well ... you're lying. You must use flour with enough gluten. In the UK, this is usually labelled "strong" or "bread" flour. For the most part, this means imported flour, since for some reason this kind of flour doesn't grow well here. If this bothers you then it is possible to buy UK-produced bread flour, for a price. Don't use plain flour - it is fine for cakes but won't work by itself for bread because it won't support the rise properly. Malted grain is made with a mixture of grains that have been allowed to germinate and then roasted, and various flours. The best known brand of malted grain bread is Hovis Granary™, and you can buy this in packets, but I find the Waitrose flour better. The same range's strong white flour is my standard white flour. Stoneground flour is milled the traditional way between two slowly rotating mill stones rather than with high-speed rollers. Some people claim this makes the bread taste better, although I'm not convinced. What it definitely means is that the stoneground flour is significantly coarser and less finely milled, which in turn makes for a denser bread because it doesn't rise quite as much. This is the easiest to use and lasts well; I use Doves. I can't taste the difference between commercial yeasts, including "organic" yeasts. Fresh yeast is the purists' choice, but this has two main drawbacks. Firstly, I don't know where to get it. Secondly, it goes off very quickly - in a week or two. An alternative source of yeast is to cultivate your own. This is how sourdough breads are made. The yeast is grown in a "starter" mixture of flour and water which requires regular and frequent maintenance, usually referred to as "feeding". It's like owning a pet. I kept a starter for about a year but really it needs using a few times a week to not be wasteful. It does add a nice tang to the bread though, even just using a little as well as commercial yeast. As long as it's clean, it's OK. You don't need to heat it up, particularly if you plan on letting the bread rise more than once. As long as it doesn't have any unnecessary additives it's OK. Use sea salt if you want (I usually do, to be honest) but I doubt it makes any difference. I usually add some vegetable oil to my everyday loaf. It softens the texture and means it will last slightly longer before going stale. Other recipes (e.g. a milk loaf, one of our weekend favourites) use butter for a similar reason. Depending on what flour you use, a teaspoon (5g) of sugar can take the edge of a very savoury taste (although I have a very sweet tooth, so this is a personal thing). Some breads are intentionally sweet of course; for example, challah often has honey in it. What you knead to know. Before I started baking, I thought it would be more complicated than it is. That's not to say it doesn't take practice, nor that finding out about it (say, by reading a book or two) isn't necessary. But I wouldn't have been quite so intimidated if I'd known these things first. Maybe these will help you. Four simple ingredients, and the only one that actually makes any difference is the flour. Have you seen the list of ingredients on commercial bread? Rather than trying to memorize or look up recipes, just remember these proportions (2% yeast if using fresh yeast. But don't bother). You can't rush good bread. Time for the dough to rise, maybe two or three times, is an essential part of the process. Mass-produced bread, made using the Chorleywood process, rises for only 45 minutes and tastes bland as a result. I know this sounds like a lot, but most of this time, the dough is rising, so there's plenty of time to do other things. The more time the dough has to ferment, the better the taste will be. I am firmly of the opinion that, if you want to do something new, the first thing you need is a book about it. Aren't books great? There are so many about any given subject that you can spend your entire time reading about it rather than doing it - and then spend even longer wondering which of the many differing opinions are actually correct! I went through a number of volumes when I starting baking bread. Most of them spend spend a couple of pages on tools and technique, and then have pages and pages of alternate recipes. For someone like me, starting from a knowledge base of zero, this was frustrating. Eventually I found some I liked; these are the books to which I return regularly. Both have plenty of recipes for you to try, but more importantly, they have useful information about the process. Far and away the best book about actually baking bread. It starts with nearly forty pages of detailed steps about how to make bread: how to knead, how to make the dough into a ball and loads of other small things that I have never seen covered in any other book. For a beginner, it is invaluable. If this much information makes bread-making sound complicated, then don't be disheartened; it's all easily learned and understood. 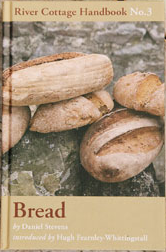 If I only had one book on bread, this would be it. A bit of cult hit in baking circles, this is on my list for two reasons. First is his revelation that ten minutes of kneading is unnecessary; and second is his milk loaf recipe, which is a family favourite in our house. He has a lot of information about using a starter for sourdough-style breads, and covers bread in many different countries too. Finally, a special mention has to go to Elizabeth David's classic English Bread And Yeast Cookery (1977). If you're interested in a really definitive work, including the history and culture around the subject, you can't do better than this. You can make bread too! Yes you can! Bread has a reputation for being tricky. I know quite a few people who "make their own bread", but who wouldn't try and make it by hand. It's not difficult though, and, like anything, it gets easier with practice. 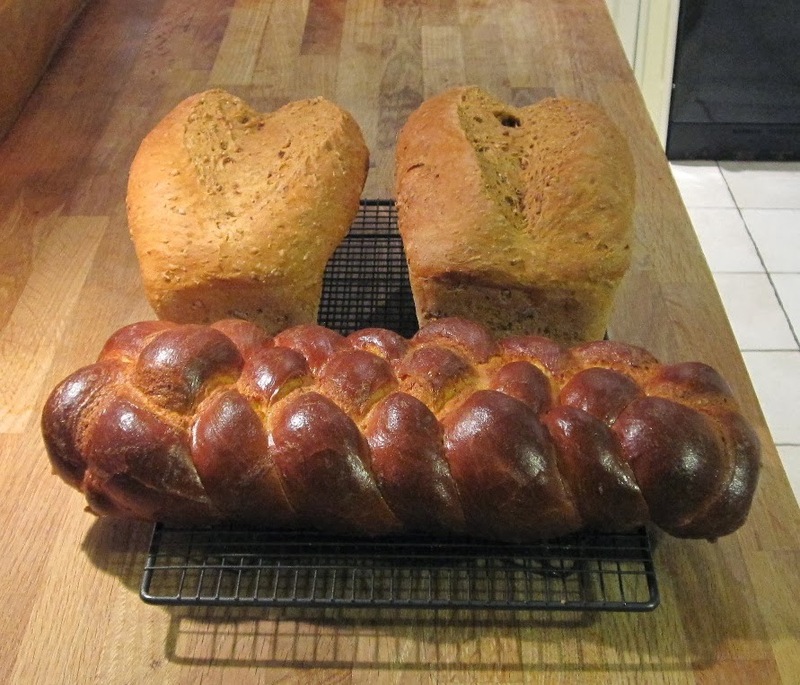 Hand-made bread is almost always better than that from a bread maker (or a shop) and you can make loaves like the challah on the right, which you can't do in a machine! I make two or three loaves a week, usually at the weekend, and although it takes elapsed time, it doesn't actually require a lot of effort. I didn't think making bread was particularly unusual, but people often ask me quite a few questions about it when they find out that I mostly make my own. There's no point in reproducing what you would find in a good recipe book, but I thought there would be value in pulling out some of the things I wish I'd known when I was starting, and tips I find myself giving people when they ask about baking. I'm going to write a few posts about different categories of things: the ingredients, the kit, the method and good books. In none of this do I claim to be a master baker - I make simple loaves for my daily lunch, not exotic types or complex recipes. I do it because I enjoy baking it, the resultant bread is always good (occasional failures notwithstanding! ), I know exactly what's in it ... and, to be honest, I enjoy being able to tell people I bake my own bread - by hand!